This show had one of the best first episodes I have ever seen. I was immediately drawn in by the story and quirky characters, the tight friendships, the lost loves, the struggle to find gainful employment, the insecurities and the humor. And all these things stayed pretty steady on throughout the duration of the show. Yet somehow I failed to love it. I was definitely entertained. But I just left it feeling so-so. And from this poster, I thought the male lead was going to be more silly and fun. That role went to the second male lead though… so… yet another poster fail. The Plot, Short Version: An unattractive girl gets her pretty friend to pose as her when meeting her childhood sweetheart. Basically its Cyrano de Bergerac. Mild spoilers follow… but not really… just musings on the obvious. The lead female, played by Hwang Jung-Eum, was one of those over-the-top physical comediennes and I loved her. As for her being pretty or not… well, she was a beautiful young woman for sure, but in adulthood devleoped some redness on her cheeks. And stopped straightening her hair. These are the only two things, apparently, keeping her from “pretty” status now – red checks and frizzy hair – and clearly as easily corrected. 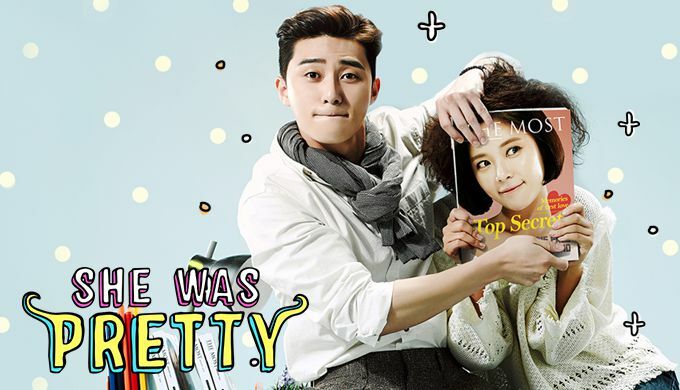 The lead male, played by Park Seo-Joon, was handsome, generally sweet, and overall extremely likable. His character went from being a chubby, awkward youngster to a strikingly handsome and successful adult. Clearly he knows his way around a stylist and since he worked in fashion, I found it very fitting that he always looked awesome. I liked these two as a first-love-reunited couple and looked forward to evolving romance in every episode. To be honest, I did get a little bored with them after they did hook up cause… I don’t know why, actually. It was sticky sweet and I wanted it that way, but suddenly I found myself full and turning away dessert. The second female lead had the potential to be amazing – but just felt lackluster in my opinion. She was beautiful, hysterically popular with men, admirably loyal to her best friend, and seemed fun to be around… but she vanished into the wallpaper of the story. However, the second male lead, also after the heart of our frizzy haired female lead, was a breakthrough. Played by Choi Si-Won, the second lead male had a completely unique personality to K-world and I was amused by his odd ball humor, subtle shifts in character, and overall story line. I’ve watched a lot of Korean dramas at this point, so when I say his character was something before unseen… I mean it. Maybe his humor annoyed you, maybe you weren’t charmed by his huge smile, maybe you didn’t care for personality… but I guarantee you, you noticed him. He felt very modern and yet very 90’s to me. That good-natured, intelligent slacker motif was strong in the late 20th century… and this character had elements of that era. His romantic overture was largely based in humor and teasing and playground antics. Anyways, it’s cute. The first few episodes in particular are stellar. It’s basically about people figuring out their place in the workforce and falling in love. Nothing too special, really, but fun to watch. Overall Rating – 7.5/10. A Flat Iron Transforms Yet Another Ugly Duckling Into A Swan.